An ultra-thin dining table that brings sophistication to new heights, the Wembley Dining Table offers a wonderful choice in a modern or retro dining area. The dining table offers two distinct table legs that feature dual tones and recessed inserts that give the piece a one-of-a-kind appearance. In addition, the table includes a large crystal clear glass top that provides ample space for up to 10 guests. Choose a stunning dining table that will dazzle day after day with the Wembley Dining Table. Two table legs include dual tones that give them a distinct appearance. Crystal clear glass top is both spacious and elegant. Table provides comfortable seating for up to 10 guests. 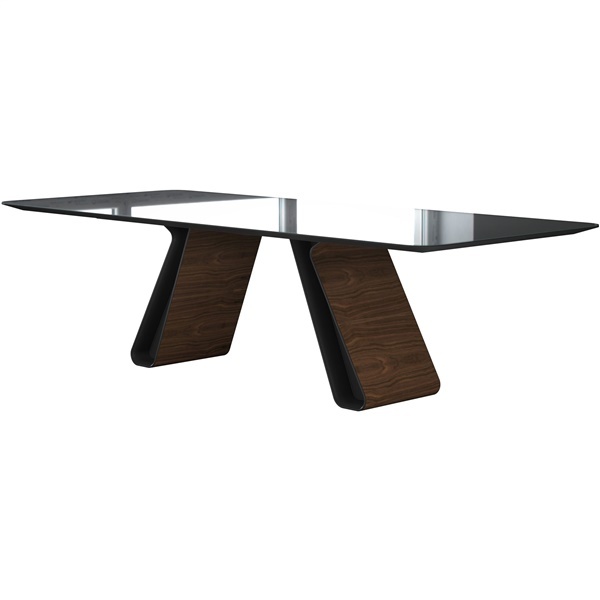 Rounded, beveled table edges further enhance the piece's visual appeal.